March 30th is National Pencil day. Come to the library and show me your "favorite" pencil. Now through March 30th, pick a free pencil to take home!! Come in now through April 20th to make a paper woven card to take home.Great for Easter or any day! Can you find a Rainbow in the Library? April 3rd (Wed.) is National Rainbow day! Find one and receive a small prize! National Library week...starting April 8th. Though we call ourselves a reading center, we are a library and offer all the same amenities and services. The only difference between our Reading Center and a library is that the Reading Center is not chartered by the New York State Board of Regents. Rushville did not have a reading center until a state-owned bookmobile made Rushville part of its route in January of 1960. The bookmobile, driver, and librarian made their rounds twice a month for an hour and a half each time. Bookmobile units were later discontinued due to accidents caused by bad road conditions. A site for a reading center was provided by Juanita Gorton on South Main Street in place of the bookmobile. It was open a couple afternoons a week with Mrs. Robert Rowe as librarian. 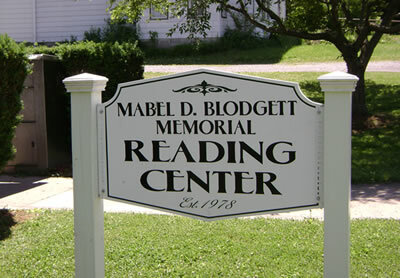 In July 1977, Miss Mary Blodgett donated money for a reading center building to be constructed in memory of her sister, Mabel, who passed away June 5, 1977. Richard Iverson of Gorham built the Mabel D. Blodgett Memorial Reading Center utilizing the donated funds. Mary provided an additional $2,000 to purchase a selection of religious books for the Reading Center. The Southern Tier Library System then supplied the rest of the books on a rotating schedule as well as inter-library systems and a delivery service. Today, our books consist of a selection of novels and stories for all age ranges and interests. Our selections include fiction, non-fiction, large print, Audiobooks on CD, magazines, picture books, boardbooks, chapter books, I can read books, Juvenille books, Young Adult books, and a small collection of graphic novels and manga. There are rotating large print books, children’s books and audiobooks on CD collections which change every three months. A variety of movies on DVD are available for public loan. Interlibrary loans and out-of-system loans for books & DVD’s can be ordered weekly. The Reading Center has a public computer section where members and guests can use the internet. Free Wi-Fi is available for guests with laptops, tablets and phones. There is a reading corner that offers a nice location for relaxing and enjoying a good book or magazine, also have a cup of hot beverage for a small fee (this is provided by “The Circle of Friends of the Library” to help collect funds for the library). There is a children’s area with a magnetic board, games, puzzles etc. along with board books, picture books and children’s DVD’s. Inter-library book loans (see STARCAT) if you cannot find it in StarCat, ask Dodie to find it in out-of-system holds. Crochet Club: Learn to crochet or just come crochet and visit! Mondays at 3:30pm. Circle of Friends of the Reading Center: Meets at the Library as needed to plan events. Call the library at 554-3939 to see what’s coming up. Come join in promoting the library! Would you like to start a club or class?! Contact Dodie at 554-3939. Outreach Program: Shut-ins who cannot come to the Reading Center may call the Reading Center to set up a time to have books, CDs, DVDs, audiobooks on DVD, or magazines to be delivered to your home (locally). Interested in becoming involved in the future of the Reading Center? Come join our Circle of Friends! We are a group of volunteers dedicated to promoting the Reading Center through publicity and community events. Meetings: Meetings as needed. Contact Dodie at the Reading Center if you are interested in becoming involved with our group. Monetary donations for the purchase of new materials are always accepted by the Circle of Friends. Thank you!